Video Recipe is a free recipe app for Windows 8 in which users can easily learn to cook variety of different recipes by watching the videos related to a particular recipe. Along with recipe cooking videos, the app also gives the step-by-step written guide on how to cook a selected recipe. Comes up three main categories — Our Offers, Fastest, and Easiest. Comes up with videos of all the available recipes . Tells to alternatives, in case the mentioned ingredient is not available easily. Available within Windows 8 App Store. Windows 8 Video Recipe App has been grouped up into three categories such as Our Offers, Fastest, and Easiest. The “Our Offers” category brings you recipes selected by this Video Recipe app. On the other hand, the “Fastest” category, as the name says, brings you videos of those recipes which can be made in less time. And the easiest ones under the “Easiest” category. As you click on a recipe, you will come across the main ingredients available at the bottom of the screen along with the step-by-step method of cooking a selected recipe. The good part is that the app displays the pictures with each step. In addition, this recipe app for Windows 8 shows an alternative to a particular ingredient, in case it is not available at home. With a click on the first step, you can watch the first step and to continue the video, just hit on the next option, appears as you click right mouse button. Check out more Windows 8 Apps. In short, Video Recipe App is a good utility Windows 8 app that allows you to learn cooking various recipes easily. 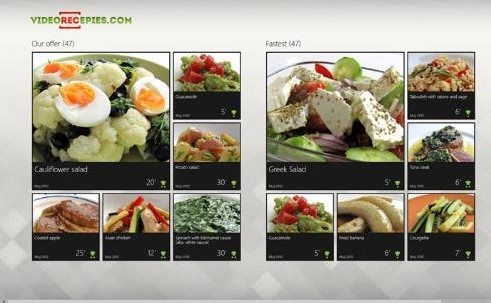 Go ahead and try this app for Windows 8 available under the Food and Dining category in Windows 8 App Store.